Facebook Messenger's pre-checked checkbox is officially gone as of April 10, 2019. It was originally removed in late 2018 for new merchants, but those who already had the pre-check were grandfathered in for a later removal date. Merchants loved using it because it allowed anyone who added products to their cart to automatically opt-in to updates on Messenger. So why is it gone now? Because it caused confusion for customers and many of them were surprised to receive messages in Messenger. Because the checkbox was pre-checked, some customers didn't know they were opting in for updates and were unhappy when they would receive messages from brands. Facebook ultimately decided to remove the ability to pre-check your checkbox. And now merchants are worried. But fear not. It's still possible to grow a massive and engaged Messenger subscriber list. Our customers who installed Octane AI after the pre-check was removed are still seeing awesome growth rates for their subscriber list. And the best part? These are customers who know they're opting in for Messenger updates. So it's a much more positive customer experience. Just like with your email list, you will want to grow your Messenger subscriber list. But how do you best grow the list without customers feeling like they're spammed? You have a lot of options for growing your Messenger list, but what are the options that work best for you? There are some great tools to grow your Messenger subscriber list. The best part? All of these tools are automated. Just set them up and you're good to go. Let’s get started. 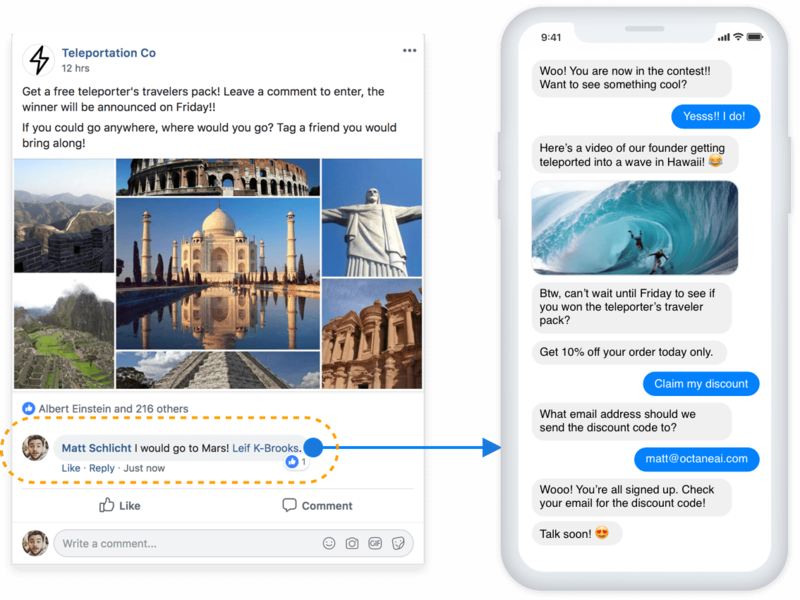 Even without pre-check, the Send to Messenger Checkbox is one of the most well-known features for Messenger Marketing. How does it work? A customer simply clicks the Send to Messenger checkbox and they will receive notifications about the product in Facebook Messenger. The checkbox is usually included under the Add to Cart button on product listings. 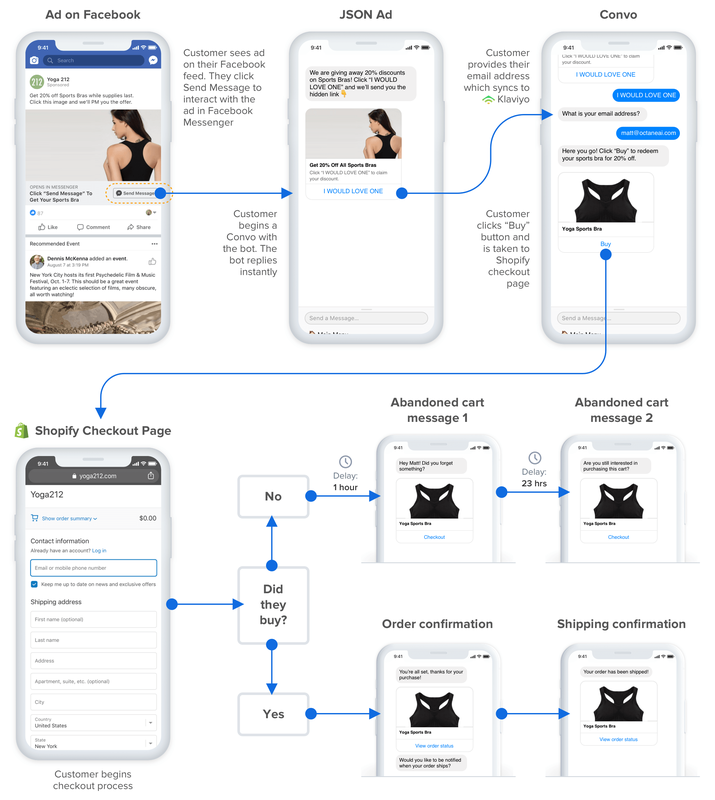 Some of the more popular notification types include abandoned cart reminders, shipping updates, purchase receipts and back in stock notifications. Here's an example of an abandoned cart message in Messenger. Ever visit a site and see a box that pops up and asks for your for email address? You fill it out and then receive an email a moment later welcoming you to the business and there might be a discount code or exclusive resource sent to you. With Messenger pop-ups, it works the same way. Customers will see a pop-up on your site asking them to subscribe on Messenger. If they subscribe, they will be added to your Messenger subscriber list and sent a message in Messenger. They will receive some kind of incentive for subscribing. An automated discount code is typical with ecommerce. If you are unsure of what incentive to use, a 10% discount code for subscribing is always a good option. Once someone subscribes, they are treated like any other Messenger subscriber. Send them campaigns, ask a question, ask how their day is going and more. You might be asking, "Why would I choose a Messenger pop-up over an email pop-up?" We hear this question all the time and we know it is a tough decision. You can run a test to see whether email or Messenger has more conversions. Run each pop-up type for a week and pick a winner. You can collect opt-ins for email and Messenger at the same time with tools like Justuno or Privy. When a visitor sees your pop-up, they can opt-in to both email and Messenger at the same time. Have you seen Facebook posts asking you to leave a comment in order to win a giveaway or contest? It’s because they work and increase engagement with users. With automated comment capture, an automated response is created for all of your Facebook posts. When someone makes a comment on that post, they will automatically receive a message from your bot, and if they engage with that message, they become a follower. The contest use case is really popular. When someone comments on your Facebook post in order to win a prize, the user will receive a message from your bot. For example, here is the Imagine Dragons Messenger bot interacting with a user about a contest to see them in Las Vegas (and yes, the bot was built with Octane AI!). These posts can also be promoted with Facebook Ads so you can increase the reach of your contest even more to bring in new subscribers. Which brings us to Messengers Ads. Messenger Ads allow you to promote your business on the Facebook News Feed. Instead of clicking on the ad and being taken to a website, people can click the ad to send a message to your business in Messenger. Why bother with Messenger Ads? Especially in ecommerce? Simple. To better connect with your customers. As online shopping makes more popular, shoppers are losing the face to face interaction with brands. 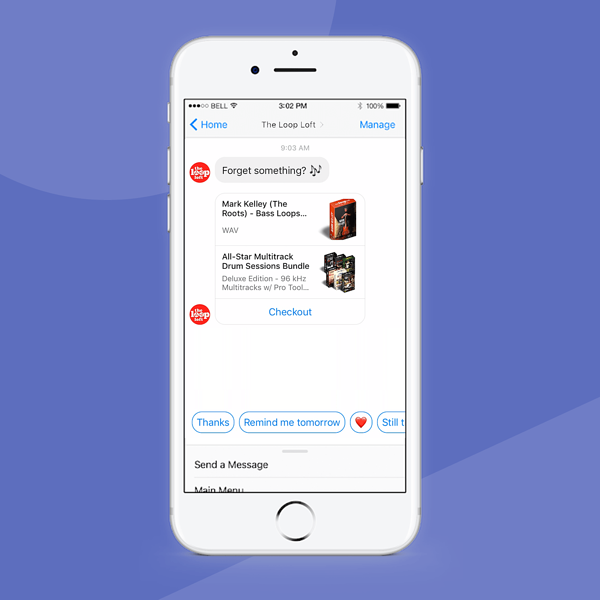 With Messenger, you can effectively connect with shoppers to recreate the in-store experience through a phone. For example, automated conversations are really popular with chatbots. How do they work? You will setup a conversation that changes based on certain conditions and responses. Did you setup an awesome automated convo that can help prospects find the perfect outfit for them? Or did you setup an awesome winback campaign? Customers on your site can chat with your business by clicking the Messenger chat widget. You can manually respond to these questions in real-time, but with chatbots, you can automate customer support and responses! How cool is that? The GIF above shows an example of how to automate live chat. With automated live chat, you don't need to worry about responding. But you can always take over a conversation if you want to. 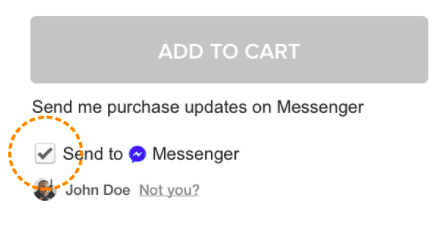 You can add a Messenger opt-in to the order status page. 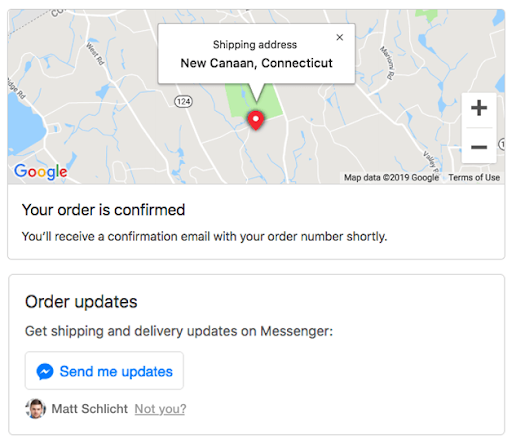 Once a customer completes an order, they can opt-in to shipping and delivery updates to be sent through Messenger. We understand there's a lot of concern about the pre-check being gone. But you don't have to worry. The methods listed above do work for merchants (as we've seen with our merchants). 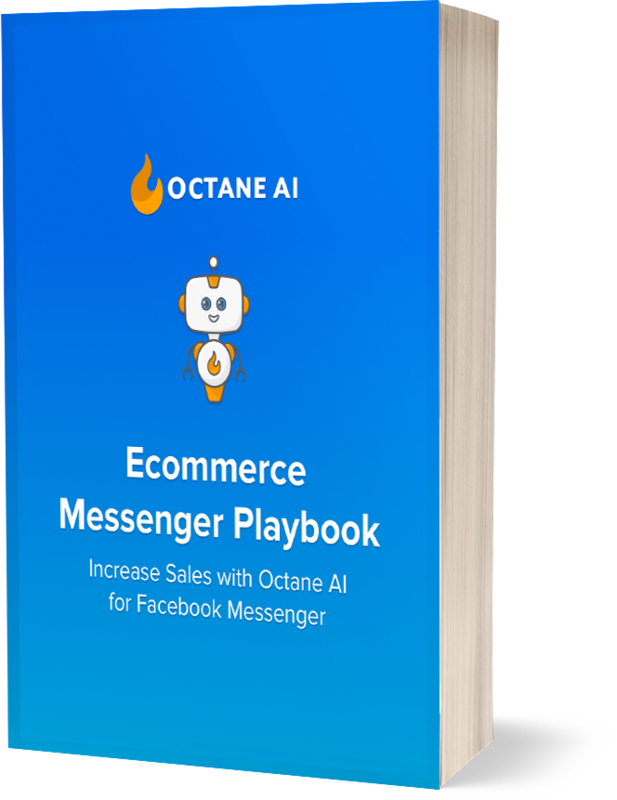 Since these are all features covered by Octane AI, we've seen our customers still achieve incredible growth rates for their Messenger list. Every single one of these tools is available in Octane AI and only take a few clicks to set up.